Chicago launched a $3 million project in 1999 to remake public housing and address the problems of concentrated poverty. SSA Professor Robert Chaskin, and Mark Joseph, an associate professor at Case Western Reserve University, studied the effort and published their findings in Integrating the Inner City, The Promise and Perils of Mixed Income Housing Transformation, published in November 2015. They did an in-depth study of three mixed-income developments. They found that new, mixed-income housing developments that replaced the former high-rise public housing structures improved neighborhoods economically. However, former Chicago Public Housing residents who moved to the developments were often made to feel unwelcomed and continued to live in poverty. They suggest a number of strategies for overcoming the problems, including broadening the range of incomes for residents, finding ways to improve incomes for CHA residents, improving public spaces to encourage better use by residents, and looking at new ways to build community. SSA students are committed people who are rigorously preparing to make a difference in the world. We inspire students to shape solutions that will alleviate human suffering and uplift the lives of the most vulnerable—in the US and globally. Our graduates are innovators and problem solvers who become leaders confronting our most vexing societal problems. Your scholarship gift can help make an enduring difference. The students you support will provide compassionate and smart service, find evidence-based strategies, and discover new approaches that will enrich and improve the lives of individuals and communities for future generations. 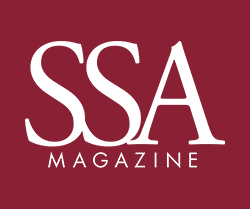 More than a century ago SSA's founders were true pioneers—fashioning a new profession, laying down the tracks of early policies and practices to protect our most vulnerable citizens, originating the use of new social science tools as a means of analyzing and addressing the most intractable of social problems. Their fearlessness and clearmindedness continue to inspire and guide us as we face persistent, increasingly complex, and emerging challenges of our day. SSA associate professor Waldo E. Johnson, Jr., PhD ’93, and David J. Pate, Jr., AM ’82, associate professor at the Helen Bader School of Social Welfare at the University of Wisconsin-Milwaukee, recently met for a conversation about their research collaborations and collective work. Americans are famously restless, always on the move. This is true of families, too, who often move in search of bigger houses, safer streets, and better schools. For the poor, however, the story is more complicated. For them, moving is often not by choice, and it often does not lead to something better. We are a nation of debtors. From 1999 to 2008, the debt held by American households surged by 170 percent, from $4.6 to $12.7 trillion. (It has since leveled off.) The well-off carry the most debt, mainly in the form of mortgages. For them, debt is often an investment in the future, whether financing a home or a college education. Melissa Hardesty wanted to study how social service agencies license foster parents. Along the way she stumbled upon a much bigger issue: how case workers in the child welfare system are caught between conflicting demands for the "objective" knowledge required by courts and the nuanced, empathetic and highly contextual knowledge needed to help families. Michael Sosin's insights on homelessness allowed him to provide critical evaluation of Chicago's 10-year Plan to End Homelessness and ultimately helped lead to dramatic reductions in the number of people in the city living without shelter. Research on programs aimed at reducing youth violence shows that there is reason for hope, says Deborah Gorman-Smith, a leading expert in the field, who has been named the Emily Klein Gidwitz Professor at SSA. As a social worker at Hull House, GraceAbbott became well aware of the struggles of immigrants, who arrived in Chicago looking for relatives and often met exploitation instead. That awareness led to the founding of the Immigrants' Protective League, which she directed and that shared space with the Chicago School of Civics and Philanthropy. Her equally talented sister Edith, who received a PhD in Economics from the University in 1905, helped lead the school. In her first week at the District of Columbia Health Department in October 1971, social worker Jane F. Quinn, AM '69 noticed an elementary school outside her window and decided to visit. Outreach was a health department mission. But Quinn, SSA's 2015 Edith Abbott Award for Lifetime Achievement recipient, was the first to cross the street to find out what the nearest school actually needed. Sanctuary cities are not new. Today's efforts to limit the use of local police in enforcing federal immigration law are rooted in the sanctuary movement of the 1980s, during which religious organizations declared themselves safe havens for Central Americans fleeing violence and civil war.